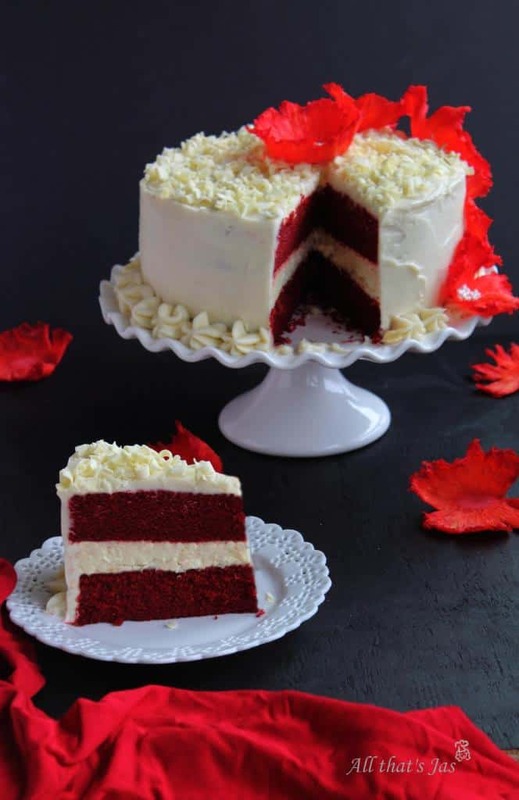 Most amazing cake combination of moist red velvet layer, fluffy cheesecake, and cream cheese frosting adorned with pineapple flowers. Place a large roasting pan on the lower third rack of the oven. Spray a 9-inch springform pan with nonstick spray and line the bottom with a round of parchment paper. Wrap a double layer of foil around the bottom and up the sides of the pan (you want to seal it so the water from the water bath doesn't seep into the pan). In a large bowl, use an electric mixer to mix the cream cheese- blend until it is nice and smooth and creamy. Mix in sugar and salt and blend for 2 minutes, scraping down sides of the bowl as needed. Add eggs, one at a time, blending after each addition. Finally, mix in sour cream, whipping cream and vanilla. Mix until smooth. Pour the batter into the prepared pan. Set the pan into the roasting pan in the preheated oven. Carefully pour enough boiling water so that there is about an inch of water coming up the foil along the sides of the cheesecake pan. Bake the cheesecake for 45 minutes. It should be set to the touch and not jiggly. Remove the cheesecake from the roasting pan and let it cool on a wire rack for at least an hour. When it has cooled, place the pan into the freezer and let the cheesecake freeze completely. This can be done in several hours or overnight. In a large bowl, whisk together flour, sugar, cocoa powder, baking soda, and salt. Add eggs, oil, buttermilk, food coloring, vanilla and vinegar to the flour mixture. Using an electric mixer on medium-low speed, beat for 1 minute, until blended. Scrape sides and bottom of the bowl with a rubber spatula. Beat on high speed for 2 minutes. Spread the batter evenly into the prepared pans, dividing equally. Bake 30 to 35 minutes or until a toothpick inserted in the center comes out with a few moist crumbs attached. Let cool in pans on a wire rack for 10 minutes. Run a knife around the edge of the pans, then invert cakes onto a rack to cool completely. In a large bowl, using an electric mixer on medium-high speed, beat powdered sugar, cream cheese, butter and vanilla until it is smooth and creamy (do not overbeat). Place one cake layer into the center of a cake plate or platter. Remove the cheesecake from the freezer, take off the sides of the pan, and slide a knife under the parchment to remove the cheesecake from the pan. Peel off the parchment. Measure your cheesecake layer against the cake layers. If the cheesecake layer turns out to be a slightly larger round than your cake, move it to a cutting board and gently shave off some of the exteriors of the cheesecake to get it to the same size as your cake layers. 2nd cake layer on top of the cheesecake. Apply a crumb coat layer to the cake using a long, thin spatula to cover the cake completely with a thin and even layer of frosting. Be sure to wipe off your spatula each time you are about to dip it back into the bowl to get more frosting (this way you won't be transferring any red crumbs into the bowl of frosting). Don't worry at this point about the crumbs being visible in the frosting on the cake. When your cake has a thin layer of frosting all over it, place it into the refrigerator for 30 minutes to "set" the frosting. Once the first layer of frosting is set, apply the 2nd layer. Start by adding a large scoop of frosting on the top of the cake. Use a long, thin spatula to spread the frosting evenly across the top and then spread it down the sides of the cake too. 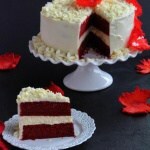 Because you applied a crumb-coat layer, you shouldn't have any red crumbs floating around in the final frosting layer. Decorate, as desired. Keep this cake refrigerated. Line a large baking sheet with a silicone mat (Silpat) or parchment paper. Slice off the top of the pineapple with a sharp knife. Cut off the rind. Using a small melon baller or a small measuring spoon remove and discard pineapple “eyes”. With a sharp knife (a serrated knife works well), cut pineapple crosswise into very thin slices. The thinner the slices, the better they will dry. You will most likely have more than 12 slices, but that’s OK since not all of them will be cut perfectly. Just pick your best looking ones to use. I have soaked my pineapple slices in a food coloring/water mixture for few hours to create this red color, but leaving the pineapple uncolored yields gorgeous yellow flowers. I added about 10 drops of red food color to 1 cup water. Transfer slices to baking sheet. It is helpful to pat dry slices with paper towels before this step. Bake until tops look dried, about 30 minutes. The baking time really depends on your oven. It took mine about 45 minutes on 330 degrees. Make sure to keep a close eye on them to avoid burning them. Flip slices and bake until completely dried for 30-45 minutes more. Pinch the center of each pineapple slice to form a cone, and let cool in a muffin tin to form flowers. It is best to leave them to sit overnight to retain the shape. I returned the muffin tin into the warm oven to help dry more and shape better. Garnish the cake right before serving because leaving them too long in the frosting will get them moist and floppy.